FRANKFURT, Germany (AP) — German automaker Volkswagen saw its profit drop by half in the July-September period due to expenses for fixing and buying back diesel cars in the United States, but otherwise had what it called a "strong third quarter" and raised its earnings outlook for the full year. Profit after tax fell to 1.14 billion euros ($1.33 billion) from 2.33 billion in the same quarter a year earlier. 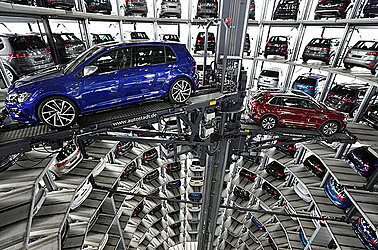 Based in Wolfsburg, Volkswagen had announced Sept. 29 that it would take around 2.5 billion euros in additional charges for complying with a settlement with U.S. authorities over diesel cars it had rigged to cheat on emissions tests.